The options are summarized in the following table. Option 2C via the SRT corridor had two separate schemes. One called “the Metrolinx option” would require the demolition and replacement of Kennedy Station, and the other a wide loop east and north from the existing station. Neither option is ideal, but the loop variant is preferred as the less difficult of the two. The option proposed by Metrolinx was ruled out because, of the two, it would be much more costly and have more significant construction impacts. The option would have resulted in a longer alignment constructed on the surface but would require a temporary closure of the subway east of Warden Station. In addition to demolishing and reconstructing Kennedy Station, the approaching tracks would need to be lowered beginning west of Kennedy Road to allow the subway to pass under the Eglinton Crosstown LRT line and access the SRT corridor. As one reads through the report, there is a sense that the chosen route via McCowan raises severe problems both technical and financial, and that a fallback position may be required, but this is not stated explicitly. The absence of comparative material to evaluate Option 2A against its competitors is particularly annoying in this regard. Options 2B and 2C are screened out early in the process because an SRT shutdown would be required for the entire project for either route coming into STC along the RT corridor. Of course, the LRT option is already off of the table, although the shutdown it would require is not as extended as that for a subway in the RT corridor. Although the report is not explicit about this, it is self evident that any combined surface-subway cannot co-exist with the SRT corridor. For a completely tunneled option, unless the tunnel boring access site were somewhere in STC clear of existing structures, this would block the east end of the SRT line, but if the line is entirely in tunnel this defeats the purpose of using the SRT alignment. Any attempt to build the SSE partly on the surface causes too many points of disruption to the SRT that it could stay open for at least part of the project. In the Strategic Evaluation, these two options come out on top in many ways, notably in the support for development of STC, something which is supposed to be a high priority for this project. The SRT shutdown is the bane of many proposals for Scarborough, including the LRT option. Updated: See the note at the top of this article in which I argue that the net cost of the SRT shutdown has been overstated by the TTC because they have not taken into account savings from extended SRT operation, nor the unused capital value of any assets acquired to operate the shuttle service. A classic problem (it could also be called a “strategy”) found in Environmental Assessments and similar processes is the creation of a straw man argument. In brief, options that you don’t want get screened out and do not receive detailed comparative evaluation. This leaves the “preferred” solution competing against the “base case” which typically is not wanted, and the “preferred” option always does better. Because Options 2B and 2C (never mind the original LRT option) don’t get a detailed review, we never see comparisons based on other metrics such as the value of extensibility, access to greater markets (residential/commercial/educational) or comparative operating and capital financials. Nor is there any attempt to find a way to build with a shorter effect on the SRT as a tradeoff between the options. An overwhelming concern of the entire exercise is the importance of the Town Centre as a focus of transit service. For decades, there has been a presence that the “downtowns”of former Etobicoke, North York and Scarborough could be wished into existence by civic pride if nothing else. This view depended on a decline of the central business district in old Toronto, but a problem developed years ago – downtown refused to die, and in fact the growth of GO Transit capacity allowed continued job growth there while residences could sprawl into the 905. In at least the medium term, there is little sign that the development industry will change its preferences, but hope springs eternal and that’s one reason the subway is favoured. The irony is that the chosen route does not serve either Scarborough travel or growth of the STC precinct as well as other options. This may be valid as a general statement, but “improved rapid transit” does not have to be a full-blown subway line. Travel within Scarborough and from Scarborough to the rest of Toronto is shown in two maps. Almost half of the trips originating in Scarborough are destined within that area, and only 23% are headed downtown. Trips that originate at STC are much more focused on the core area. This is an interesting, although less than meaningful map because so few residences are at STC. Many more trips flow through STC because it is one of two nodes (the other is Kennedy Station) created in Scarborough as foci for core-bound travel. A subway will serve trips to downtown well, provided that a rider can get to the subway easily. It will serve trips to STC itself only to the extent that potential outbound riders would originate in the subway’s catchment area. This is not true of a considerable part of Toronto, let alone the 905. Another example of the effect of the STC focus is an observation that taking the line north to Sheppard could be counterproductive to STC’s development. The report then observes that the north-south alignment would place a station slightly closer to the centroid of the STC precinct, but that the east-west alignment is a better fit for future growth. Scarborough Centre has significant development potential with the entire Centre designated mixed-use by the Official Plan. In Options 1 and 2A, Scarborough Centre Station would be located 38m closer to the centroid of Scarborough Centre than in Options 2B and 2C (see Figure 8 and 9). The options 1 and 2A station would also be closer to the McCowan Precinct where significant development is expected in the future. This station location would bring slightly more of the Centre within walking distance of a subway station (0.6km2 vs. 0.5km2). The station would be approximately 200m from existing office buildings and development blocks on the east side of McCowan Road. From these perspectives, Options 1 and 2A offer improved proximity to people’s workplaces, and support economic development slightly more than Options 2B and 2C (Figure 9). This is somewhat misleading because the starting point, 2001, saw a very low population in STC, and so a high percentage growth was easy to achieve. The claim does not change the fact that very little development is in the approval pipeline for STC as shown by the City’s own data. Meanwhile, the importance of Lawrence East Station is downplayed, especially in its new location at McCowan. The emphasis on growth at stations ignores the role of feeder services that bring riders from beyond walking distance. This is ironic considering the vitriolic defense of subway proposals with low walk-in traffic compared to the LRT scheme and its additional stations. For transfer riders, the view of SmartTrack is completely different. But then we learn of transfer traffic at STC itself. It is estimated that compared to the SRT, the SSE would incent between 3100 and 4500 net new daily riders to use transit in 2031. Relative to Option 1, Options 2A, 2B and 2C incent an additional 1400 riders to change their travel mode (mostly auto), which would minimally reduce congestion on roadways in Scarborough or freeing up road capacity for other travellers to make trips. This increase in overall transit system ridership is partly due to an estimated reduction in travel time over the base case (SRT approximately 12 minutes from Scarborough Centre to Kennedy) by up to 5 minutes (which does not include a transfer at Kennedy Station), allowing people to access further locations by transit in less time. For Options 2A, 2B and 2C, all day boardings at Scarborough Centre Station in 2031 are projected to be approximately 31,000. AM peak hour boardings at Scarborough Centre Station in 2031 are projected to be approximately 7300. Projected AM peak hour boardings are similar to projected AM peak hour boardings at Kipling Station (approximately 6000) and would represent the second highest projected AM peak hour boardings on Line 2 (after Yonge Station and approximately equal to boardings at Kennedy Station). This is a roundabout way of saying that Lawrence East is an important station, but that its would-be users are expected to take an alternate transit route. The nearly 4,000 peak hour riders implied by the difference in projections for each option would consume two full-sized GO trains worth of capacity at Lawrence East SmartTrack station, and that is a considerable chunk of the trains/hour that will operate there. The many “strategic” metrics for the options are summarized in Table 12, and clearly show Option 2B as the superior choice within this evaluation. The original estimate for the three-stop version of the subway was $3.56 billion including inflation, and based on a 2023 opening date. This has gone up quite substantially due to more accurate technical data, and a 2025 delivery date including both inflation and the cost of keeping the SRT operating longer. This is a huge increase in only a few months, and one must ask how Council can make an informed decision about anything with such uncertain figures. The estimate class levels cited above are still higher than “3”, the point at which numbers should be used for budget purposes. (This is a scale where a low score is better than a high one.) There is some attempt to explain away these changes. There may be a $1.5 billion “saving” by building only the one-stop version of the line, but its cost will soak up much of the committed funds requiring a “top up” by the City beyond what it expected to pay. Escalation is an issue for costs. Since 2013, design for this project has advanced to approximately 5%. The associated cost estimate has increased by approximately $1B (YOE/Escalated $) more than the original estimate of $3.56B (YOE/Escalated $). This is primarily due to two reasons. First, the subway stations were found to be much more complex than the ‘typical’ stations assumed in the initial estimate. For example, a subway station at Lawrence Avenue East had been assumed to be a typical depth of about 16 metres (the height of a 5-to-6 storey building), but given the topography in that area, the station would actually have to be built about 30 metres below the surface – roughly equivalent to the height of a 10-storey building. The other two stations were also found to require greater depth than originally assumed, though not as dramatic as at Lawrence. In addition, after a thorough assessment was made of the bus services in this area, and how those routes could be modifiedto feed the greatest number of customers directly to these new subway stations, the associated bus terminal designs were much larger than assumed prior to conducted this necessary study. The added station complexity made up about two-thirds of the extra cost. This paragraph makes the obvious assumption that the entire pool of funds earmarked for Scarborough projects, including the LRT line that was affordable in the “optimized” network, is actually available for the subway extension. There is no acknowledgement that Council approved the full optimized network, not just the subway. Indeed, it was the LRT line that brought some Councillors onside with the package NB. Although Option 2B scored highest on the strategic points getting almost a perfect score, it foundered on the issue of an SRT shutdown. Without a technical or financial evaluation of this option, we don’t know what might be possible or how it would rank relative to other options. After a study in which the possible subway alignments were studied extensively, two variations of another option is back on the table. These are the Brimley alignments shown in illustratrations below. 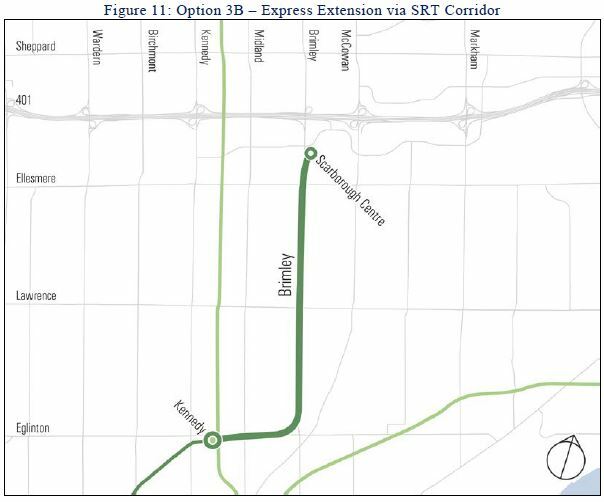 Option 3A is rejected because its use of the SRT corridor through STC station would require an SRT shutdown, and because the curve at Brimley and Ellesmere is constrained by adjacent condos. Option 3B ends just northeast of Brimley at the entrance to STC, and can be built while the SRT remains active. 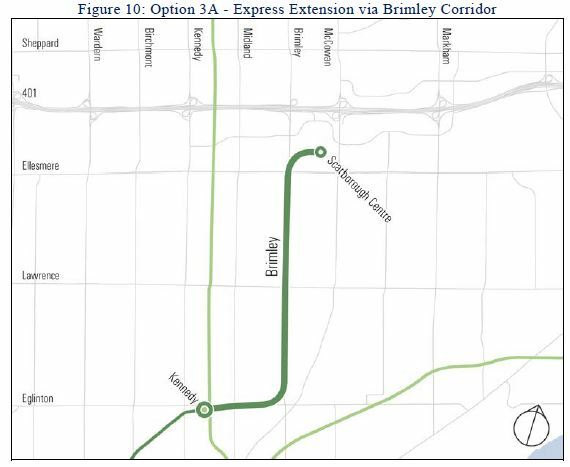 These options appear to be “just in case” inclusions in the study, and there is no real sense of the Brimley route being selected. In any event, if Toronto is going to launch an EA soon, then the route (s) under study must be nailed down. This rather hasty move with SSE options show how easily what looks like a solid proposal can be redefined because someone gets a brain wave. As a matter of planning strategy, the “3B” study should indicate whether an east-west alignment is possible to stimulate growth, but the City has its heart set on “2A Express via McCowan”. This has the feeling of a study where “the fix was in” from the outset thanks to the premise that both subway and LRT lines would bebuilt within the available cost budget. Both the LRT option and the two alignments that did not follow McCowan are excluded from detailed conversation. By such methods is real debate stifled, and a plan that could be better in a development and planning sense never gets off of the drawing boards. This entry was posted in A Grand Plan, Scarborough RT/LRT/Subway, Subways, Transit. Bookmark the permalink. “The SRT shutdown is the bane of many proposals for Scarborough, including the LRT option. I sure would like to see a breakdown of this aspect. That sure is a lot of buses. I highly doubt the TTC supplies 63 extra buses when there is a shutdown of the SRT. Sir do you mean to imply this isn’t how transit mega-projects should be planned out? I don’t believe it. Royson James in the Star has done another nice piece on this sham. Steve: Yes, it’s quite amazing to see James this worked up. When he talks about exposing the cockroaches at City Hall, you know he is really pissed and has lost all confidence in Tory’s administration, not to mention the professional staff who prop up Tory’s delusions. There seems to be a political forcefulness that took hold of this issue which goes a step beyond pandering to voters. If the SSE is bad for taxpayers, bad for riders, and damaging or knocking other projects off the table throughout the city, who is it exactly that stands to benefit from this project? This level of political grandstanding on the part of some is rarely seen, certainly in matters that are legitimately in the public interest. A few other naive politicians seem to have gotten suckered into cheerleading it without actually knowing the backroom reasons the project is being pushed. There has to be a money trail that extends outside the political arena. If Royson James is so fired up about this perhaps he should move beyond (justifiably) slagging Mayor Tory and see if The Star has the fortitude to dig deeper. I highly doubt that will happen because The Star is the crowned champion of developer apologists in this city and pulls in substantial advertising revenue from them for it. This thing stinks like a dump in July. Steve: If SmartTrack were actually going to bring significant new service, then I would think that “follow the money” would be imperative. However, very little is left of ST, and by the time GO/RER actually begins operation, Tory’s second term as mayor will be in its final days. This is pure political posturing by someone who does not have the faintest idea of what constitutes a good transit plan, and who is receiving terrible advice, assuming that he listens to any of it. The SRT is shut down this weekend. How many buses are assigned to the substitute service? Granted that no peak hours are involved. What we have is a binary choice between one LRT plan or a number of possible subway routes. What is needed is someone to solve the problem; “how to connect Scarborough City Centre with Downtown (or at least the Yonge spine) with a continuous transit line”. I don’t really care if it is subway, LRT, SkyTrain or mini-metro. Maybe we need to start drawing lines on a map, because I think there is a solution to be found, as long as open minded people are put in charge. Steve: The way you frame the question is part of the problem in the entire debate. Travel demand in Scarborough is for more than “STC to Downtown”, and an LRT network addresses that in a different way from the subway and SmartTrack. If that type of link is your goal, build SmartTrack and forget about everything else. To me, the growing criticism of John Tory ignores the fragmented GTA decision making ‘process’ that the poor guy inherited. How anyone could be expected to cut through the three tiers of local warlords in two years is a mystery. I don’t even blame him for refusing to admit fault; because, to do that in Toronto invites bitter attack from at least two of our ‘newspapers’ and all of our experts. I’ve seen him in action, more than once, out of the public eye, and he comes across as a generous, decent person. Maybe our transit experts should request a low key meeting. I’d be willing to bet that he would accept. Steve: I too have seen John Tory out of the limelight, and he is a decent person, but he can be quite stubborn. As for getting meetings, this is very difficult as his office is quite insular. The Scarborough subway wouldn’t be running until 2025. Will the RT even last that long? If not then we might as well just order some new RTs (or used Skytrains) and be done with it. I never thought the LRT conversion made much sense. Are LRTs that much better than the RT trains? We made the decision thirty years ago, might as well work with what we have rather than shut it down and rip it up for a marginal capacity increase. If capacity is the issue, it’s better to just build more lines, rather than squeeze more onto one corridor. Whatever happens, I really hope we don’t end up with the one stop subway. It’s a complete joke – you have the express train (Smartrack) making local stops and and the local train (subway) making express stops. The three stop subway, however expensive, would at least be useful for the network, with better station locations than the RT corridor. More so if there were a Brimley/Eg station, eventually swinging over to Malvern. Steve: The decision to use LRT or the updated Mark III version of the technology rests on two questions. First, is there a wider LRT network of which the SLRT would be part? Retaining an orphan technology has different implications depending on whether there is going to be an economy of scale with other LRT lines. Second, do you ever want to extend the line? The economic case of replace vs rebuild is quite different depending on the answer, with LRT winning out if the line will eventually continue northeast to Malvern. The answer is simple… Just stop making excuses & design the surface subway Is it more difficult than the LRT? Slightly. But far from a great engineering feat. Taking the easy way on Scarborough Center is not acceptable & a big part of the reason we are here today. Is it more respectful to Scarborough residents and the future of STC? Yes by far. Clearly the currently plan is not a reasonable option & clearly the SLRT is nothing more than a cheaper, segregated solution & aside for a couple extras stops is not well received or reasonable for many reasons. Both sides need get this done & the Star need to STFU with the same old 7 stop rhetoric. LRT loop around Eglinton, Kingston and Sheppard and a surface subway. It’s a fair compromise and avoids creating greater Political tension. Even this plan is not perfect, especially on Sheppard. But a solid compromise given the circumstances. Good point. If the RT cannot be kept on life support for that long, then there is no good reason to exclude options that require the RT shutdown during the construction period. I’m guessing this is a thoroughly considered and determined to be stupid idea, but I just can’t help myself. Why is extending the Bloor-Danforth line the only option for serving STC by subway? A Sheppard line extension could solve the political issue while also providing useful transit service to residents of Scarborough, couldn’t it? Saves the ‘new’ costs of building a Bloor extension near the lake–the presumed reason for the latest $1 billion price increase? Steve: Overloading the Yonge line is one big issue with a Sheppard extension because it would divert demand that now hits Yonge at Bloor onto the line further north. This would actually make the need for a Relief Line to Sheppard even more pressing. “Saving” the cost of the Sheppard LRT misses the point that Scarborough would lose a north-south link it now has with the SRT and a roughly comparable one it would still have with the subway or an LRT replacement for the SRT. Further extension to the east and north (Malvern) would be prohibitively expensive (as it will be for the subway option, and was for the SRT in its time). Building “near the lake” has nothing to do with the extension’s cost, and it does not actually run all that close to Lake Ontario. This is an issue for downtown lines because the old lake bed extends inland and complicates construction, but all of Scarborough is north of the dividing line. There is a major geological problem at Lawrence and McCowan with the crossing of Highland Creek, and it would make a station there difficult and expensive. Why isn’t a complete cut and cover tunnelling being considered? How much money can cut and cover tunnelling and a shallow station at STC save? Steve: If the route is via McCowan, the upheaval to the neighbourhoods through which cut-and-cover construction would pass would be enormous. If via the SRT corridor, it, like other schemes for that corridor, would require shutdown of the RT before construction began. Without question a shallow tunnel is cheaper, but nobody wants the disruption. Scarborough may want a subway, but not that badly. I thought I would note the completion of a recent project that would cast the enormous cost the Scarborough Subway Extension into perspective. The Panama Canal … Up until recently the largest vessels that could transit the canal were “Panamax” vessels — the largest that could fit through the canal’s lock. Panama just completed building a new set of locks, much bigger locks. I was amazed to read that the entire panam project, dredging the entire canal to a deeper draft vessels, and the construction of gitant looks, cost $3 billion. Mind you, that was US dollars. Still, it will carry enormously more valuable cargos than the SSE. I was amazed to read that the entire panam project, dredging the entire canal to a deeper draft vessels, and the construction of giant looks, cost $3 billion. 4) No financing costs were included. As a side note, if you have a week and a strong liking of self-propelled boating, it is possible to transverse the Panama Canal in a kayak for a very reasonable fee. Steve: Some time ago, using the per kilometre cost of the new canal, and the then available price for a Swan Boat, I determined that this combination was the most effective transit solution available to Toronto. Steve – so what’s the current SSE subway cost incremental to the SRT project? How much would that fund of the Sheppard subway? It always seemed like Scarborough was ok with the SRT upgrade if there was a Sheppard subway, wondering if the costs are so high now, if it is worth it to re-divert the $$$s. Steve: There is no way that the updated SRT/LRT replacement would be over $2 billion, and so there is at least $1b in hand. However there are other claims on the leftovers including the line to UTSC. John Tory: Many of the subway’s loudest critics do not live or work in Scarborough, where more than half the population is born outside of Canada. When they say this is too much to spend on a subway, the inference seems to be that it’s too much to spend on this part of the city. Citynews: some critics say Tory is painting subway opposition as anti-immigrant. I think that John Tory is right as Scarborough is almost 80% non-white. Before you condemn John Tory, please know that Tory himself is white and I admire John Tory for having the courage to state the truth. Steve: Your statistic is wrong. Scarborough is majority non-white, but not 80%. On the other hand, given the demographics, I suspect that the proportion of non-whites on transit is higher than in the community as a whole. As for Tory’s statement, it is true to state that Scarborough has a lot of immigrants. Stating that opposition to the SSE is anti-immigrant presumes that the motive is to do ill to people who “don’t count”, as opposed to believing that Scarborough could be better served by a different transit network than the Mayor proposes. Huge parts of Scarborough get little benefit from the SSE compared with the coverage provided by the combination of three LRT lines. I believe that the race angle to the Scarborough subway opposition has not been analysed here but even if we forget about the race part, John Tory is right when he states that “Many of the subway’s loudest critics do not live or work in Scarborough”; I believe that Steve Munro does not live or work in Scarborough but when he did work in Scarborough, I bet that he would not have been opposed to the Scarborough subway. Steve: When I worked in Scarborough (left because I retired, not as a move out), I did not argue for the subway, but in fact have supported the LRT plan as always. It would have brought me to work just as fast and provided better service northeast of STC. Huge parts of Scarborough get little benefit from the SSE compared with the coverage provided by the combination of three LRT lines. But you are intentionally misleading when you state that because John Tory NEVER said that only the Scarborough subway should be built in Scarborough. John Tory wants to build at least one of those three LRT lines (may be even two or all three) in addition to SmartTrack and the Scarborough subway and so that’s a network that serves well large parts of Scarborough. I am from Scarborough and I fully support John Tory’s plans for the Scarborough subway, SmartTrack (which also serves Scarborough), Eglinton East LRT, and more. What you (Steve) are saying is akin to “Huge parts of Toronto get little benefit from the St Clair West streetcar line” and so should we get rid of the St Clair West streetcar line? St Clair West streetcar line is part of a network which together provide greater benefit to large parts of the city and likewise, the Scarborough Subway is part of a much larger planned network of higher order transit in Scarborough which will provide immense benefits all over Scarborough. Steve: Until Jenn Keesmaat proposed the Eglinton East LRT as part of the Scarborough package, Tory only supported the subway. Now that his subway takes all of the available money, Eg East’s status is again dubious. It shows up on the City Manager’s presentation today (June 28) as “unfunded”. As for St. Clair vs SSE, the issue is appropriateness. If there had been calls for a subway on St. Clair because the residents and businesses “deserved it”, even with low ridership, I would have opposed that too. If we go back to the start of 2012, we had a MOU on the connected Eglinton–SRT line and Ford and the Conservative Movement were quite popular. Then, Council voted to kill this transit line, take back control of the Transit file, and revert to the Transit City version of LRT. That summer they voted down the Stintz subway and continued support for the LRT. The next year, over half of Councilors who voted to reinstate the LRT, voted to support the “Scarborough Subway”. Overlapped with this, Metrolinx completed a report on the connected Eglinton–SRT line in June 2012 that found it was the best. This report was not released until an FOI request by Michael Schabas in December 2013. In that time, the Provincial Liberals would manipulate City Council and the voters to support the subway, while withholding the crucial information that should have been the centre piece of the debates. The end result was that all (but 1 I believe) City Councilor was re-elected and the Provincial Liberals achieved a majority, largely thanks to Toronto. So all in all, both Councilors and MPP’s view Scarborough transit as a huge success to this point. John Tory is right when he states that “Many of the subway’s loudest critics do not live or work in Scarborough”; I believe that Steve Munro does not live or work in Scarborough but when he did work in Scarborough, I bet that he would not have been opposed to the Scarborough subway. When you resort to ad hominem attacks rather than addressing the point at hand, there’s probably something indefensible about your argument. A one-stop subway to the middle of the STC isn’t the best use of money for the STC, Scarborough, or Toronto. But you are intentionally misleading when you state that because John Tory NEVER said that only the Scarborough subway should be built in Scarborough. Toronto has a limited borrowing ceiling, so supporting the subway is defacto unfunding any LRT for at least a decade or so, unless someone else steps in and fills the void. Beyond which, John Tory’s original position was that Scarborough ONLY needed SmartTrack. Until Jenn Keesmaat proposed the Eglinton East LRT as part of the Scarborough package, Tory only supported the subway. Now that his subway takes all of the available money, Eg East’s status is again dubious. It shows up on the City Manager’s presentation today (June 28) as “unfunded”. You are wrong as Tory also always supported SmartTrack which would also serve Scarborough in addition to so many other places. You are again misleading by trying to suggest that Eglinton East LRT is showing up as unfunded because of the Scarborough subway. Eglinton East LRT was always unfunded and Eglinton East LRT was just conceived only a few months ago and it takes time to get funding as studies making business case for the project need to be completed which take time. Let that process complete and I am confident that Eglinton East LRT will find funding without tapping into the urgently needed Scarborough subway’s funding. Also note that even the Toronto Star (one of the loudest voices against the Scarborough subway) admits that the Scarborough Centre subway station is expected to be the busiest on the Bloor Danforth line and so that’s more than a justification to build it. Steve: No. 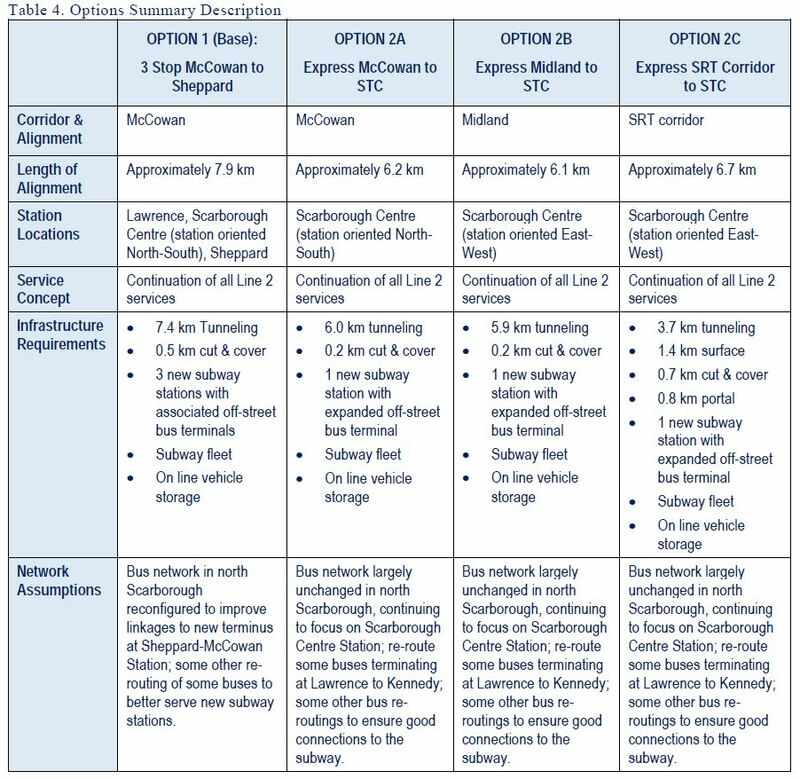 When the “optimized” Scarborough network was proposed, the whole idea was that money freed up by shortening the line and cutting two stops was explicitly available to fund to LRT line. That’s how the package was sold. As for SmartTrack, my statement was in the context of which of the alternatives Tory supported. Indeed, he originally ONLY supported SmartTrack, but his position has been evolving. I don’t think John Tory should have brought up the immigrant issue. If anything, he has things backwards. Some of the largest immigrant communities in Scarborough are NORTH of the 401 while the Scarborough subway and UTSC plan all mysteriously stop SOUTH of the 401. Why do you think that is? Scarborough Town Centre and UTSC are the least ethnic parts of Scarborough, yet they’re the places getting all the new transit. Personally, I think any plan that doesn’t serve Sheppard Ave to be very peculiar. Lack of inclusiveness is a good reason to argue against the Scarborough subway. Scarborough Town Centre and UTSC are the least ethnic parts of Scarborough, yet they’re the places getting all the new transit. Personally, I think any plan that doesn’t serve Sheppard Ave to be very peculiar. Not that I’m trying to defend the Scarborough Subway (I would build the LRT to Malvern, if it were my choice), but this statement conveniently ignores the fact that 1) the Crosstown East runs through some of the least affluent and most diverse parts of Scarborough en route to UTSC and 2) there is supposedly a planned and fully funded LRT on the books for Sheppard already, so it would be even more peculiar if city planning were to plan another one. For the record, I work in Scarborough (in the same building where Steve used to work), and the previously planned LRT was fine with me. Time-wise, there is little difference between a subway trip from Kennedy to STC or an LRT (or existing RT) trip. Furthermore, with the existing RT (and presumably the LRT), there are two stations serving the area, unlike the single subway stop which will certainly leave some people much further away from their destination. What exactly is “respectful” to Scarborough residents? Or to the rest of the taxpaying population of the entire city that they, too, will be on the hook paying for this “jewel in the crown of Scarborough” over the next 30 years? How is the fact that politicians and public servants at all government levels lied, obfuscated the truth, misrepresented facts – call it what you will – considered “respectful”? Because, well, Scarborough’s getting a world-class SUBWAY (station), that’s why! It makes me think of those door-to-door furnace salespeople coming to your house and telling you that you MUST replace the old clunker, just because… “Well, don’t you worry about that, Sir/Ma’am, we just *know* these things. Oh, and don’t we have the perfect model for you that just happens to be “on special” right now; it will be all energy efficient – it’ll do the trick, tickety-boo! Just sign right here….” Meanwhile, Mr./Mrs. Homeowner ends up paying $1000 a month for the thing and – OOPS! – no, you CAN’T get out of your contract. Heck, you can’t even remember what exactly the nice man at the door said to you 6 weeks ago, so I guess you just gotta keep paying for it…. Ironic that the provincial government has recently gotten all up-in-arms about folks cheating seniors out of their hard-earned cash when it comes to door-to-door high-pressure sales, but they themselves are responsible – both by commission and omission – for the flimflammery involved with selling the subway for political gain (cf. Brad Duguid’s comments) and encouraging city politicians to do the same. This makes is sound like riders are going to be galley slaves, having to row themselves to their destination. A subway, meanwhile is an expensive, segregated solution. It’s not well-received because Rob Ford screamed “Subways, subways, subways” as the only answer against those damned “streetcars” – plus Scarborough *deserved* it. Councillor Glenn De Baermaeker told his constituents that they deserved a subway and that anything less was unacceptable. Scarborough MPP Brad Duguid, who has been fighting the good fight for his constituents, has said that Scarborough deserves a subway and that those “downtown elites” (not professional planners, or folks who actually know about transit) are just holding Scarborough back from realizing its potential. Mayor Tory has now joined the fray, not wanting to re-open the transit file – even though the original LRT agreement is still signed and valid and PAID FOR* – saying that the Scarborough subway will dovetail nicely with his SmartTrack(TM) plan – um, sort of – and that Scarborough deserves it. LRT would offer more than “a couple extra stops” and would be the spine to expand the line farther north and east – and all this could be accomplished almost before the subway is started, at the rate things are going. What’s not reasonable is politicians arguing for spending more money than the City actually has to pay for something that, on a cost-benefit analysis basis, wouldn’t work in an Economics 101 class discussion. For transit users in Scarborough, the way things are going, they would move faster riding a horse. Meanwhile, what they’ve had to deal with is a horse’s a** and what comes out of it…. The decision to use LRT or the updated Mark III version of the technology rests on two questions. First, is there a wider LRT network of which the SLRT would be part? Retaining an orphan technology has different implications depending on whether there is going to be an economy of scale with other LRT lines. Second, do you ever want to extend the line? The economic case of replace vs rebuild is quite different depending on the answer, with LRT winning out if the line will eventually continue northeast to Malvern. So now Byford is saying that reverting back to LRT could cost as much as $3B when factoring in sunk costs for work on the subway design, reconfiguration of Kennedy Stn, etc. 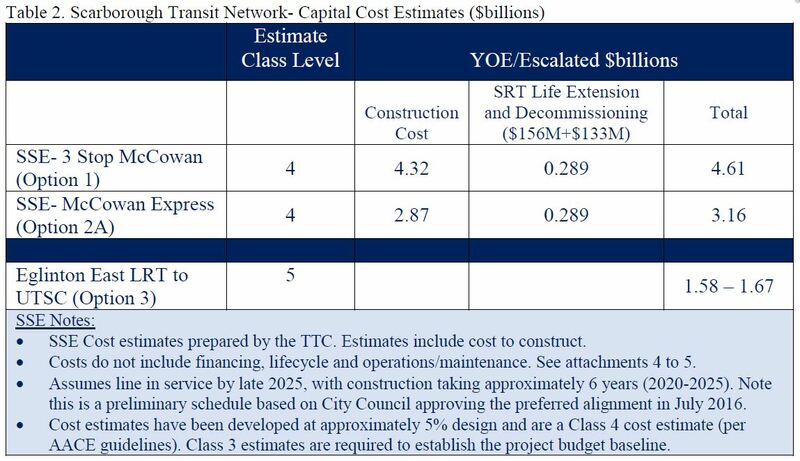 That figure seems awfully high to me, but the bottom line is this: if a subway is built, it will likely never be extended beyond STC anyway. In fact, I don’t think anything other than an LRT would ever be extended beyond STC, but reverting back to that plan doesn’t seem likely at this point. It seems to me that revisiting the option of simply purchasing new, custom-built cars to run on the existing RT track/curves/tunnel makes the most sense. There would be no shut-down of the existing route, and the custom order could very well cost less than the $3B+ currently on the table. True, having an orphan technology is not ideal, but neither is a lengthy shutdown of the existing RT, or a 6km one-stop subway with four fewer stops than the existing line. Joe M., you hold some minority views here. I think others here would agree with me, that, even though we may disagree with you, we recognize that you may be able to voice good convincing arguments, that might get us to change our views. But, for that to happen, I am going to request you make a greater effort to be clear about what you mean. Consider the following comment you made. It is open to multiple interpretation. I certainly don’t want to respond to arguments you didn’t actually make. I want to learn something, not win arguments by fair means or foul. So, “surface subway”? This statement could be interpreted as you abandoning the Scarboro Subway Extension in favour of John Tory’s “surface subway” up the old railway right of way. Alternately, you could be suggesting that a new right of way be bulldozed through 6 kilometres of Scarboro’s arterial roads and suburban neighbourhoods, to STC. I am sure you understand how bulldozing a thousand Scarboro bungalows would seem “respectful” to Scarboro. Or you could mean running a surface subway along the old SRT right of way, as the Wynne Government suggested. I’ve tried to follow your past arguments, and I don’t think any of these position is consistent with what you have said, in the past. Steve: I have to jump in here an point out that the engineering staff have already flagged that a “surface subway” would not be on the surface for much of its length. WRT to the phrase “far from a great engineering feat”… just because an engineering project can be described, does not mean it can be achieved, or that it can be achieved at a reasonable cost, or that it is a good idea. John Tory’s original SmartTrack plan is a good example. There is no way his original plan could deliver subway like frequency and passenger capacity at anywhere near the bargain-basement cost he promised. So, SmartTrack, achievable, but only at greatly increased expense, with multiple tunnels, and given that one of the main selling points was low cost and no tunneling required, means it should be off the table. If we are going to go to the expense of tunneling, we can think of a lot more optimal, central routes — like the DRL. And, with regard to respect for Scarborough residents, they too will ride, or otherwise benefit from a DRL. Only way to truly come out of this backwardation to still provide respect for current locations, further locations, Scarborough City Center & politicians egos is a surface subway on the RT route. It would be amazing for Scarborough and worth every extra penny compared to the one stop underground or LRT transfer design. I am coming in to this a bit late, having read a recent Globe & Mail op-ed about the $3 billion subway extension that Tory is defending. I am left scratching my head and pondering if Public Works should be checking the water at City Hall for possible contamination. 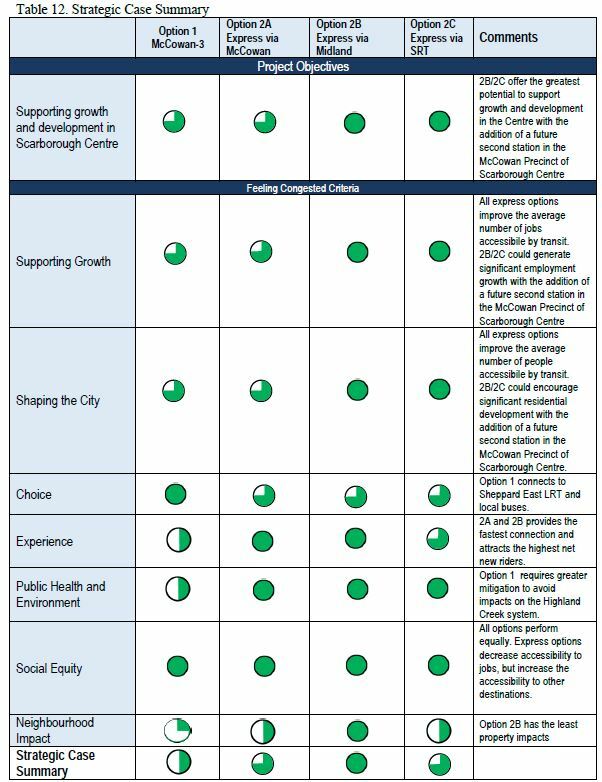 As a former resident of Scarborough (1993 – 2014) I had support the LRT option – it seemed to be the most cost effective option, since it would have used the existing right-of-way and stations. I’ve now been in Calgary for 2 years and experienced how well their LRT system works – the LRT that could have replaced the aging SRT would have been similar. Calgary is currently planning its biggest transit project ever for a new LRT line, which when completed would be 40 km in length, running from the north end of the city down to the very southeast corner – the estimated cost are roughly $4-5 billion. Currently the biggest hurdled is how to route the line through the downtown and so far the costliest option to run it underground (and under the Bow) is the recommended choice but otherwise, as with the other two lines, it will run at grade in its own right-of-way. Great! You are someone who can answer some questions from experience. In Calgary the LRT runs at grade, and the traffic system is arranged to make sure LRT vehicles always get a green light. An elevated system, or an underground system, never has to cope with an ordinary vehicle shutting down an intersection, because it broke down, or there was a fender-bender, or more serious accident. Is the automated system clever enough to detect that a broken down vehicle is blocking an intersection an LRT vehicles has to go through? Does it have time to tell the next vehicle to stop before it ploughs into the vehicle blocking the intersection? How often are intersections blocked by broken down vehicles, or accidents? Will the cops prevent vehicles being removed, because they want to finish their investigations? Edmonton recently signed a contract with Bombardier, to use Flexity Freedom vehicles similar to those that Metrolinx will use here on the new line they are building. A difference is that their vehicles will have seven modules, not five, and are rated for a maximum of 275 passengers, slightly more than Metrolinx. The C-train crosses a roadway at grade with railway type signals, including bell, flashing red lights and guard barriers so the LRT always has right-of-way. Although there have been incidents where a motor vehicle has breached the barrier and in some case collided with trains, since I have been here there have been very few such incident and I have yet to personally experienced any delays due to such incidents. Most of the delays are due to mechanical issues with trains, though again this seems rare (all the more impressive given most of the original cars are still in service after over 30 years). I should point out that in the case of the SRT, from Kennedy to STC there are no level crossing so this would not have been an issue. Calgary could have gone with subway or at least an grade-separated LRT but decided the cost was not justified. The two existing lines use high-floor LRVS and 60 new high-floor cars have been ordered from Siemans to replace the oldest cars and allow for expanding the trainsets from 3-car to 4-car. The new line being planned will use LFLRVs, however I believe they have also chosen Siemens for these.